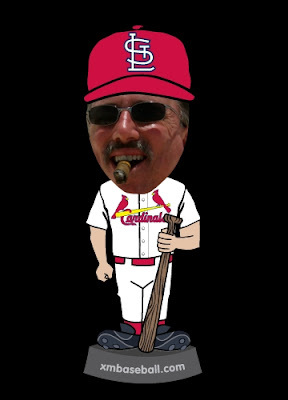 With my Cardinal's struggling to keep in second place in their division, it's time to call up to "The Show" Bobble Head Wells! Created with all the best attributes of a sport's hero and bucking the trend of dipping for a real man's cigar, Bobble Head Wells comes complete with his on Punk Rock Version of "Take Me Out to the Ball Game" when he comes to the plate. Opposing pitchers will fear his shaded stare, tobacco stained sneer and awesome bat speed. Not to mention when his head begins to "bob" the distraction is obvious. Catcher's hate his "Cigar Smoke Screen" that hides their pitch signals. Bobble Head Wells will be in St. Louis Tuesday night with his "Bat Girl - Make My Head Bobble Allwinky" to make sure victory is ours!